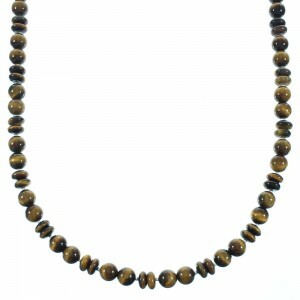 We carry the leading selection of Native American tiger eye necklaces available. Whether you're in the market for an everyday accessory or a handcrafted tiger eye necklace for the most special of occasions, we have the right item to suit your taste. 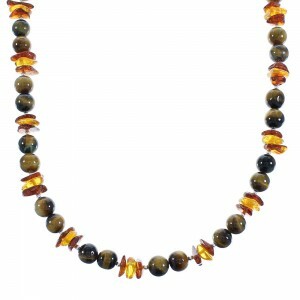 Tiger's eye is a metamorphic rock with a silk-like luster and golden to reddish-brown color. When the stone is polished, it's easy to appreciate the lovely details and layers of colors that make this material such a popular choice. 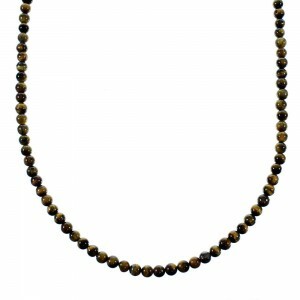 The tribes of the Southwest make the most detailed and sought after tiger eye necklaces available today. The stone itself caries a deep spiritual meaning for tribes like the Navajo, Hopi, Zuni and Pueblo. 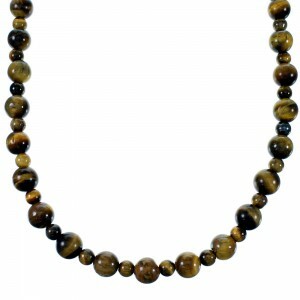 Some believe tiger's eye gives courage, clear thinking and wards off negativity. Other cultures and tribes believe the stone provides good luck and helps the wearer feel at one with themselves and their surroundings. It has been said that the stone resembles the evening sun setting behind mountains, due to the beautiful veining and blend of colors found in this magnificent stone. In many ways, the rippled bands of colors reflect the rugged canyons and desert landscapes found in the Southwest. 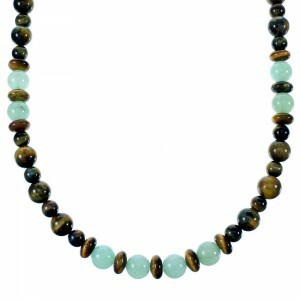 The stone itself is mined all over the world and has long been respected and cherished by many cultures, from South Africa and Burma to Australia and the United States, where the stone is mined and used to make tiger eye necklaces. 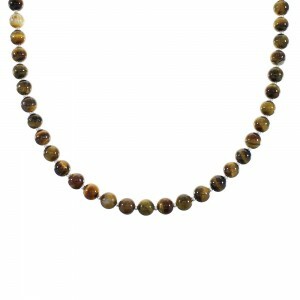 Our selection features tiger eye bead necklaces with beautiful stone inlay center pieces. 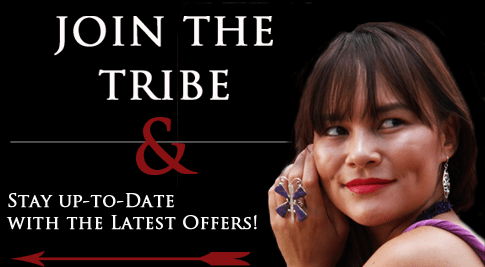 Nothing catches the eye like a stunning gemstone set in genuine sterling silver and nobody makes a more stunning jewelry design than the Southwest tribes. 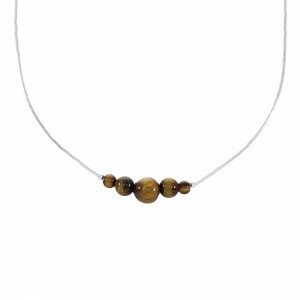 Our artists have designed a tiger eye necklace to suit any taste at prices well below the industry average. 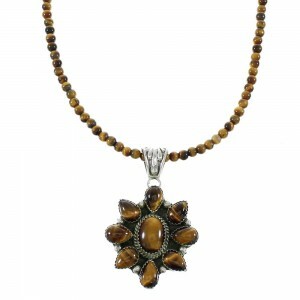 Tiger eye necklaces have also been used to portray wealth, status and tribal affiliation. Our products reflect the rich history and craftsmanship of Native American tribes and embrace the artistic visions of those who design our pieces. Over the years, tribes have developed and perfected distinctive styles and every tiger eye necklace we carry honors the tradition and stunning design American Indian jewelry is known for. 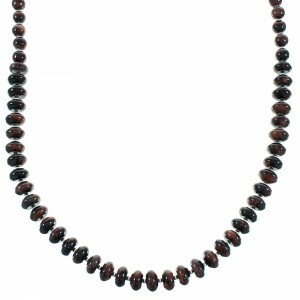 At SilverTribe, we strive to offer the most diverse and distinctive collection of tiger eye necklaces at the best prices on the web. We have a growing inventory that is guaranteed to turn heads for a high desert fashion statement. 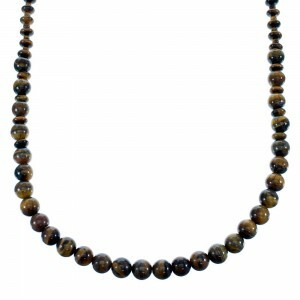 Of the diverse and vibrant selections of stones we carry, tiger's eye is among the most popular. 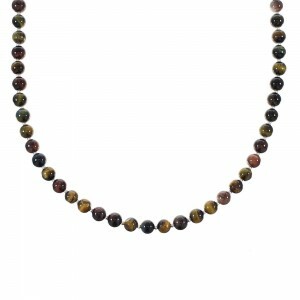 Explore our selection of tiger eye necklace designs to see why we are the online leader Native American bracelets. We always strive to offer the highest quality products at heavily discounted prices. Our jewelry is made to exacting standards and never fails to captivate. If you are looking for a piece of jewelry with rich detail and true lasting power, your search ends here. We have something for anyone, no matter the style or budget. 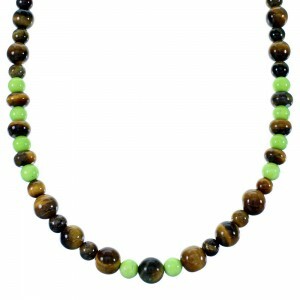 Stick with SilverTribe for all your tiger eye necklace needs. No one matches the beauty and value of our products.